Are your outside light fixtures looking shabby and dated? Paint chipping off, discolored, buggy, and just gross? Are you a DIYer and want to save money by repainting them yourself? You’re not alone! We had three outside light fixtures in rough shape after 12+ years in the sun, heat, and humidity of Florida. 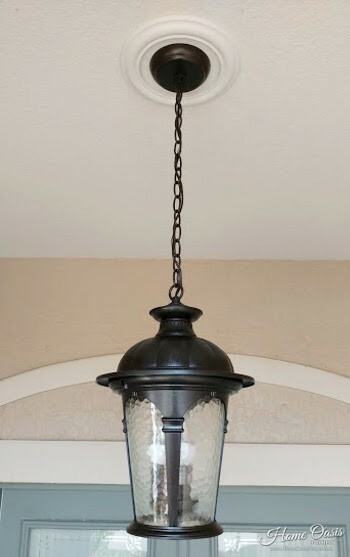 One of the light fixtures hangs from a chain from the ceiling of our front entry. The other two light fixtures are wall mounted on each side of our garage door. We didn’t want to spend hundreds of dollars to buy new lights and hire someone to do the work. Time to DIY this! We took this opportunity to install LED light bulbs because they last a long time and save energy. Who wants to keep replacing light bulbs?! Especially if they’re up high and require a ladder to reach! Please be safe and first turn the power off at the circuit breaker before disconnecting the lights. Being electrocuted is not fun! Once the electricity to the lights is off, remove your outside lights from the house. You’ll probably need a ladder and a helper. Be careful! The light fixtures are probably held on be screws or bolts. Once loose, hold with one hand (or have the helper hold it) and disconnect the wires. If you’re not comfortable with this part, hire an electrician or handy man. Once your lights are taken down from the house, remove the old light bulbs. Definitely consider upgrading to LED bulbs when you’re all done. Next take apart the pieces of the light fixture as needed (see pic below), and remove any glass if applicable. I needed to use a Philips screwdriver to take ours apart. Give them a quick clean by spraying them down with a hose and letting them dry in the sun. Gently clean the glass panels and set them aside for safe keeping until you reassemble the finished light fixture. Here comes the fun part….well maybe not so much fun as the most needed part. Turn some music on and the time will go by quickly…hopefully! Haha! Start by taking a flat head screw driver and carefully chip away any flaking paint. The screw driver does a good job getting loose paint out of the tight, detailed areas. Try to avoid scratching the metal. Be very diligent about removing all the loose, flaking paint. If you paint over any loose paint, it will start to flake and chip off again quickly. So take your time and really get in there! Our outside light fixtures are aluminium with a good amount of oxidation. If yours are steel, chances are you will have a lot more rust to remove than we did. A great product to help is Rust Reformer. Once you have sanded your light fixtures, use the Rust Reformer to ensure it won’t rust further and it help create a nice paintable surface. 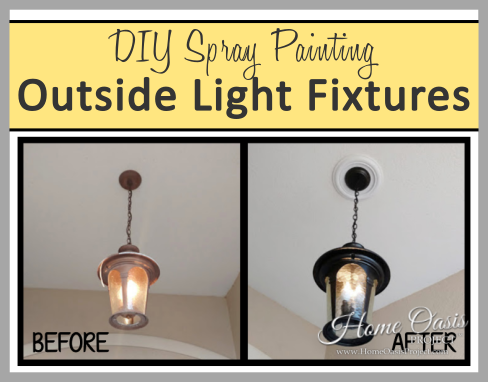 Once you have the outside light fixtures looking awesome, with all of the chipped paint gone and totally sanded, you need to clean them off again. Clean them thoroughly and remove all residue to ensure the paint goes on smoothly and really adheres. I sprayed ours with a hose, patted them dry with a paper towel, and then let them dry in the sun. I also wiped them down all over. Some spray paints recommend that you use a bit of soap too. Definitely read the directions on your spray paint to make sure you’re prepping correctly. Now comes the fun part. Spray painting! This is where you’ll see the biggest transformation. Rust-Oleum makes a great spray paint and primer in one. I choose oil rubbed bronze (“orb”), but they also offer many other colors. I recommend placing your lights on a cardboard box outside and wearing a mask, gloves, and eye protection since this will be messy. And watch out for the over-spray floating around! When working with spray paint, you want to do light, even strokes. It’s okay if you have to do several coats. This will look better than doing super thick coats. Make sure to let the paint dry fully. I did 3-4 light coats to make sure I got full coverage of the outside and inside of our light fixtures. After you have your outside light fixtures spray painted evenly to your desired color and they are dry, you’re ready to hang those babies up! First, assemble the light fixture and screw in the light bulbs. Make sure you get light bulbs that will fit! We choose Cree LED light bulbs (ours are candelabra shaped) rated for enclosed outdoor light fixtures. Then put the cleaned glass panels back in…I did this last to avoid finger prints. For an added chic architectural look, add a plastic ceiling medallion like we did before you re-hang the light. Reconnect the wires with wire nuts and then reattach the lights by screwing or bolting them back in place. Have a helper help and be careful on the ladder! Once everything looks good, turn the power back on at the circuit breaker. Now pat yourself on the back for a job well done!!! 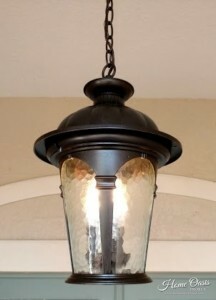 Below is another example of refinished outside lights…these are our wall sconces from each side of our garage door. As you can see in the picture below, they looked “tore up!” Paint was chipping like crazy, they were completely discolored, and were embarrassing. 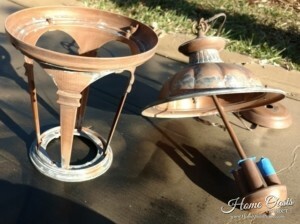 Using the techniques listed above, we spray painted these light fixtures in oil rubbed bronze to make them look brand new. Check out the transformation! How awesome does this look?! With a little bit of labor and money, you can make your light fixtures look BRAND NEW! Saving money, check! Saving the environment, check! Winning at DIY, check!